The day was a rainy one, the rainiest we’d experienced since our arrival 9 months before. Spirits were dampened and the walk was wet. We’d end up spending 7 hours in the tribe that day, at Oua Tom. And hours, days, weeks, months digesting what we had learned. But the draft title is too long and says too little about the content of this post, so I couldn’t use it. But keep that quote in your mind, for it is indeed a direct quote. Our guide’s father had said it to him, in all seriousness, when he was a young boy. 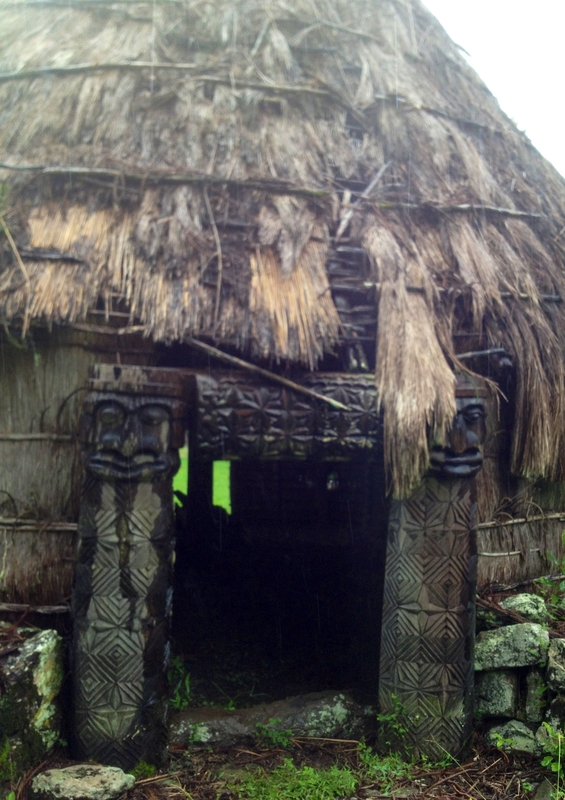 About 75 minutes outside Nouméa, up near La Foa, we visited the Oua Tom tribe last weekend. We were in a relatively large group and were able to choose from a few activities within the tribal grounds that day. Some dared an “easy” walk with a guide, up a mountain, that was to last 3 hours. It lasted 4 hours, was rather dangerous, and was not a marked path (imagine your guide clearing the way with a machete up a wet mountain in the driving rain, dealing with mud slides: you get the picture). 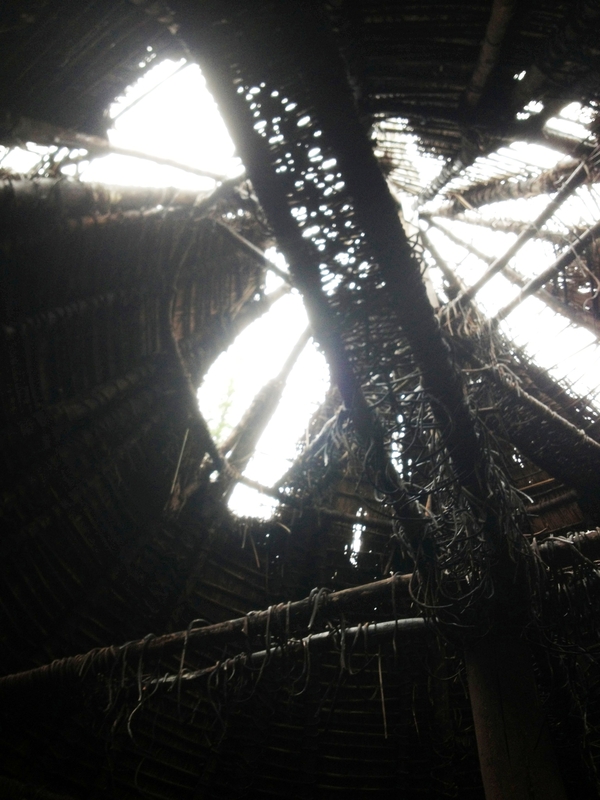 Others stayed behind to learn basket weaving and take a tour of the huts (“cases”) and tribal lands. We opted for the second set of activities, which was followed by a traditional lunch of “bougna“. Our first lesson came when our group commenced “la coutume”. La coutume is an introduction and the offering of a small gift, as an act of respect. It is also the time when you should express gratitude and ask permission to see or visit the tribal lands. Protocol is such that you should not hand your gift to the chief or tribe member, when carrying out la coutume. You should place the gift on the ground in front of the person. This then allows the person to accept your gift or not. If you hand it to him or her, you are obliging him/her to accept it, which is very badly viewed and will most likely get you off on the wrong foot. 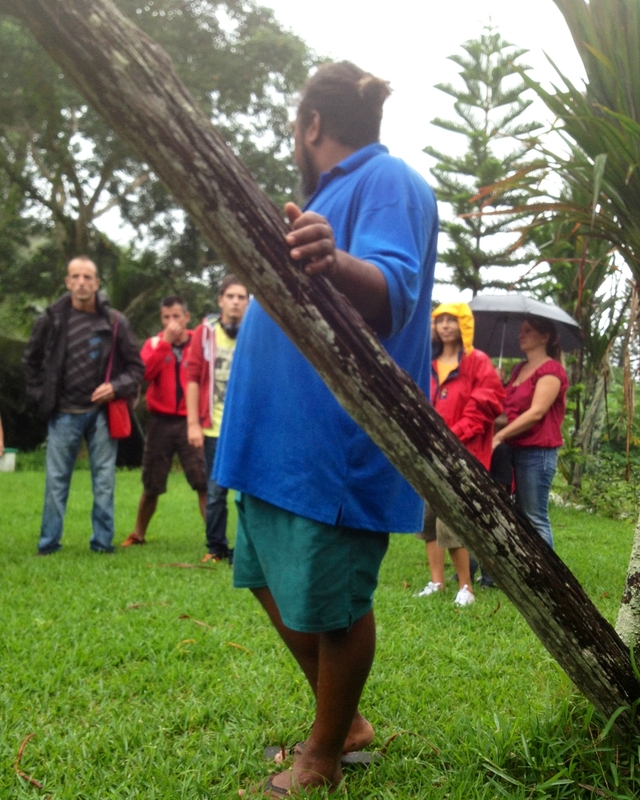 Our second lesson came as we were walking through the tribal lands with our guide. He explained that at a very young age (around 5 or 6), the tribe teaches their children that white people are the enemy, that they are bad, that they are evil. They explain that it is the white man who stole their land, killed their men and took their women. As the guide pointed to our son, a blonde child, he explained that little boys like this are despised, from an early age. And that their sons, our son’s age, were the ones doing the despising. At this point I had to ask myself why our guide was telling us this, and with what seemed like pride. Was it to inform us, somehow, of the way things are? Was it to somehow warn us? Why were we welcome here on this visit? Or were we? Our third lesson was in tribal law, as it existed before French law came into place. You see the tree branch planted in the ground above? You’ll find one in front of most tribal huts. This is where “justice” is done. Thieves, rapists, murderers used to be tied here. In the case of rapists and thieves, they would be beaten with whips of fire by a wide circle of tribal members. Thieves also had their hands chopped off. Murderers, their heads. Today, they no longer carry out these punishments (because French law forbids this). But our guide explained that the elders have lost control of the youth, that the youth no longer respect elder/tribe or chief authority. He explained that they have learned that if they go to the police, they can say they were crazy or disturbed when they committed the given crime. Then they’ll be sent to prison, and will be housed and fed, and that’s much easier than what would happen to them in the tribe (note the Nouméa gunman earlier this week wanted to go to prison to escape the pressure of his family to find a stable job). He despaired of what is happening, that with the loss of control, things have gotten far more dangerous in New Caledonia. 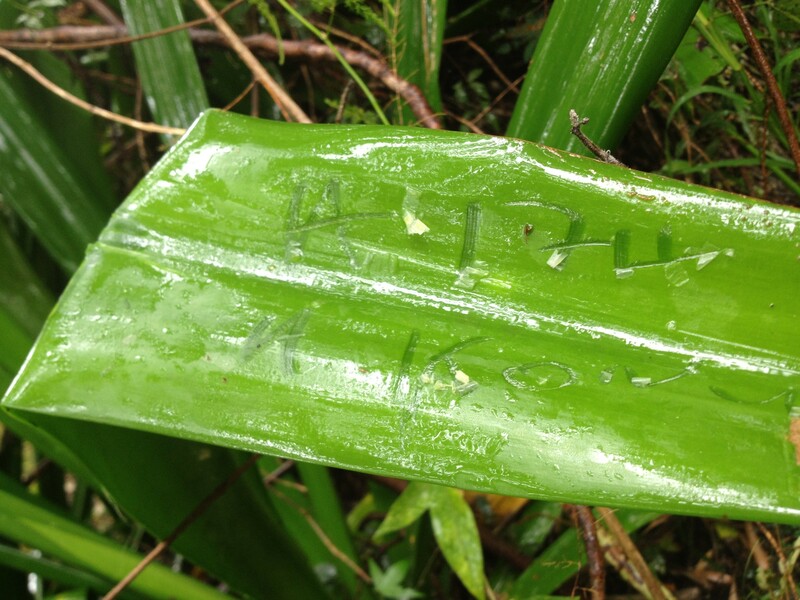 He explained that at night, the police no longer circulate outside Nouméa. When the sun sets, the police close up shop. He said that if you run out of gas on the roads, you can call the police, but they won’t come get you. They’ll tell you to get in your car, lock it, roll up the windows and not get out (and not let anyone in). They’ll come get you in the morning. Keep in mind that this was a Melanesian, an Oua Tom tribal member (whose brother is the chief) telling us this. He said that when the police want to enter tribal lands, they call ahead, from the entrance, but they will not come at night. At times, the tribe will allow the police to enter the lands, but will not give up a guilty party. They are invited to “try and find him”. He assured us, however, that sometimes, some of them drink. And that then the meetings went on for an eternity, the minute an inebriated elder got the floor. Fighting happens, as it turns out, not between chiefs (who do the talking), but other members of the tribe, usually the ones who own or occupy the land (rather than govern it). And when the meetings happen, the chief sits not in a place at the head, but among the other members. This is to prevent an assassin from knowing which one is the chief should he enter the hut during a meeting with the intent to kill. And back to the quote we started this all off with. ‘I hope you never do anything I don’t like. If you do, I’ll have to kill you.’ Such were the words that our guide’s father spoke to him when he was young, one son among ten. Such was the law the tribe practiced and such was the warning a father issued his son, as the young man grew into manhood. It is entirely possible that what we learned that day is erroneous or mistaken. I did ask questions and tried to clarify things as so much of this was surprising, and I discussed what we learned with other people there that day – to try to validate that I had heard correctly. One clearly came away thinking that the tribe wishes it could return to its old ways, that it could punish and control its youth, that it could resolve things like it used to. They blame us for what we’ve done, taken their land, stolen their livelihood, spoiled their young, tempted their young into crime and utter disrespect. I wish they didn’t look upon us all as if we were evil, the ones to blame. For many of us are not, many of us share their concerns and sense of unfair treatment. How in the world are we going to work towards a common destiny, as they say, if the young are told that white or black or brown or yellow, man, woman or child are to blame for what has happened? The gunman this week knew that if he “injured a white”, he’d be sent to prison, and thus set out to hurt someone based on skin colour. Surely this cannot be the way up and out for the future of our youth, for the future of New Caledonia. Very current and insightful read by Julie Harris.